Rep. Ilhan Omar (D-Minnesota) listens to Speaker of the House Nancy Pelosi (D-California) during a rally for H.R. 1 on the East Steps of the U.S. Capitol, March 8, 2019. Members of Congress are being urged to speak out against President Donald Trump’s latest attack on Rep. Ilhan Omar—one some are characterizing as an incitement of violence against her. The call is in response to an edited video the president posted on Twitter Friday afternoon. As of this writing, the president has that tweet pinned. In the video, a short phrase the Minnesota Democrat uttered at a speech last month—”some people did something”—is repeated three times, interspersed with footage of the aftermath of 9/11 in an effort to portray her as minimizing the attacks. The manipulation of the comments she made to the Los Angeles chapter of the Council on American-Islamic Relations (CAIR) comes after they were already pounced upon this week by some Republican lawmakers and right-wing media, who used them incite hatred. It also caps off a week in which Trump encouraged the idea that Omar is somehow “assaulting Jews” and in which Omar faced a death threat from a Trump supporter. “There’s a 200 mph ideological right-wing war machine coming after Ilhan Omar” as well as fellow freshmen members of Congress and women of color Reps. Rashida Tlaib (D-Mich.) and Alexandria Ocasio-Cortez (D-N.Y.), he told MSNBC on Thursday. Pressley was among the progressive lawmakers denouncing the president’s video compilation. “The occupant of the @WhiteHouse is putting her, her family, her team & Muslim Americans across the country in jeopardy,” she said. The political elite want us divided by our religion, race, where we live, and where we’re from, so that we fear each other. They keep us distracted while they consolidate more power & wealth. They are the real enemy. Despite threats to the congresswoman’s safety, Trump continued “using her as fodder for ridicule” in a weekend speech. 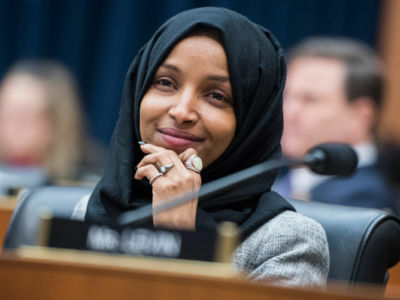 The rush to reprimand Representative Omar highlights Democrats’ close ties to pro-Israel groups and their money.